400 million in the middle class. In 1980 Shenzhen had a population of 30,000; by 2016, Shenzhen had a population of some 12 million. When I first came to China as a 34-year-old investment banker in 1998, I flew to Beijing to pitch a Chinese tech company looking to raise about $100 million in an IPO. Back then, for a $100 million tech IPO, really the only game in town was the U.S. NASDAQ market. 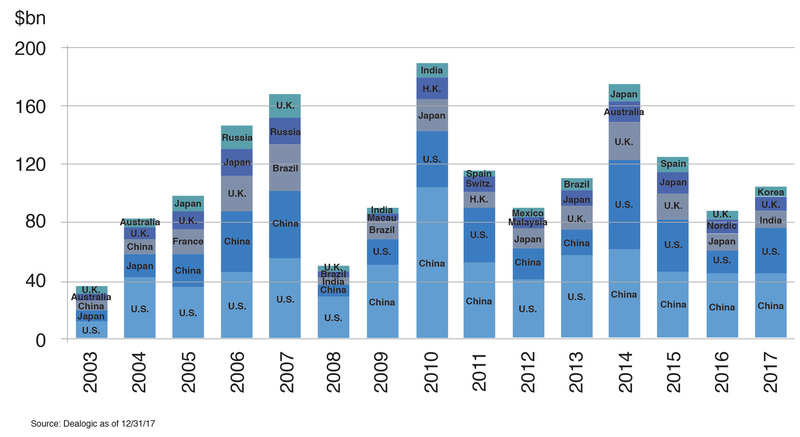 Back in 1998, as companies from emerging countries (e.g., Brazil, China, India, Russia) started to go public, with local currency restrictions and liquidity constraints — as well as other challenges, such as a lack of international investors — there were three or four markets that attracted the bulk of the international listings – London, Hong Kong, New York/NASDAQ and Tokyo. For most companies from emerging countries in Europe, the Middle East and Africa, London was the preference; for most companies from emerging countries in Asia and Latin America, New York/NASDAQ was the preference. NASDAQ, until probably 2014 when Alibaba went public on the NYSE, was the market where most growth companies globally went to list. Things have changed dramatically in the last 20 years. To give another perspective, the second graph below, via Barclays, shows the 15-year trend (203-2017) of the top five countries by issuer nationality with the most IPO volume. Since 2008, Chinese companies — versus those from any other country — have collectively raised the most IPO capital in seven of the last 10 years. What has changed over this 15-year timeframe is that most of Chinese activity prior to 2008 was the capital raising for state owned enterprises (SOEs), while activity post-2008 is for more traditional privately owned companies. The high water mark for Chinese IPO capital formation was 2010 when there was a combination of factors that drove this activity. In addition to public equity capital formation, companies in China also receive a significant portion of the private equity capital globally. Estimates by Bain & Company in their 2018 Asia-Pacific Private Equity Report suggest that approximately $73 billion was invested in greater China in 2017 by private equity firms — almost half of the capital invested across the Asia-Pacific region. Not only is there significant capital being deployed by the leading private equity firms globally, but also by some of China’s largest companies — such as Alibaba and Tencent. Estimates suggest Tencent has invested over $30 billion since 2015. While some of this investment has been in international companies such as Tesla, Spotify and Snap, Tencent has also been a significant investor in China, notably in 13 Chinese multi-billion-dollar companies that have gone public since the beginning of 2017, including Meituan Dianping, which has just raised over $4 billion. Tencent owns about 20% of the company. In three of those big companies, Tencent had major stakes of 40% or greater – China Literature, SEA and Sogou. Tencent also announced earlier this year that wholly owned Tencent Music will list in the U.S. Alibaba, meanwhile, has also made many significant investments, including as the largest shareholder of Ant Financial, which recently raised about $14 billion, called the largest single fundraising globally by a private equity company. Alibaba owns about a third of the company, rumored to be valued at $150 billion. While China’s leadership in IPO capital raised over the last several years could change if trade tensions with U.S. become prolonged, the demand from private equity capital firms and Chinese corporations is likely to continue, and may increase — as we have seen in the U.S. in recent years — if IPO activity lessens. One of what may be China’s best economic secrets is that it is home to not one, but two of the most powerful e-payment platforms globally. Ant Financial’s Alipay and Tencent’s WePay are estimated to each have more than 500 million active users. Trying to provide comparison to the U.S. market is difficult, but it is quite clear that the e-payment market in the U.S. is just a fraction of China’s. Two metrics providing some context are that, according to Statista, PayPal, the largest U.S. comparable platform company, has 244 million active users globally; and the U.S. banking system overall is expected to have 161.6 million digital banking users by next year. While Tencent’s WePay is largely linked to WeChat, Tencent’s dominant messaging service, Alipay, has been quite visibly building partnerships outside of China especially in Southeast Asia. 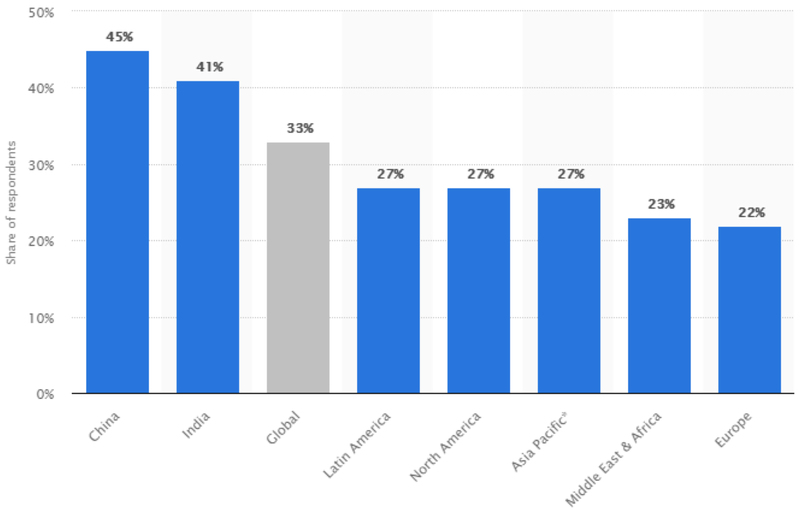 With the Chinese mobile payment market estimated at approximately $5.5 trillion in 2016 and with 45% penetration of Chinese internet users (as seen in the chart below from Statista), China is clearly the biggest e-payment market in the world. Given this tremendous opportunity for Ant Financial, one of the discussions on our trip was with a panel of public equity institutional investors that target China about whether in the long-term, Ant Financial would exceed the value of Alibaba, its founding shareholder that spun what was then Alipay off to shareholders in 2011. With the ability to potentially be the e-payment platform in international markets where e-wallets are prevalent but technology is lacking — such as in Africa, the Middle East, Latin America and Southeast Asia — the potential thesis is that Ant has a tremendous opportunity with limited international competition versus Alibaba, which has largely been limited to China, and has the challenge of Amazon and other competitors internationally. 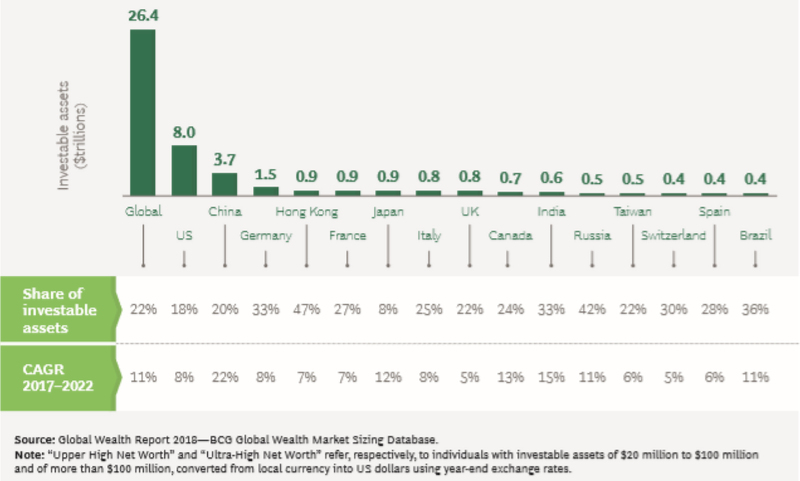 BCG in its 2018 Global Wealth Report estimated that China represents some 15% of the upper high net worth and ultra high net worth individuals (HNWIs) in the world, and that those groups are growing at a 22% CAGR. BCG defined personal wealth for upper HNWIs as being greater than $20 million but less than $100 million, and ultra HNWIs as having wealth than $100 million. If you add up the numbers for greater China, including Hong Kong and Taiwan, the investable assets for upper- and ultra high net worth individuals represent more than $5 trillion dollars. This, coupled with the approximately 400 million people characterized as the Chinese middle class, creates a significant source of wealth potentially as the Chinese economy matures. This is why Chinese wealth management is considered one of the biggest opportunities in financial services globally. This opportunity, like many in China, is in its early stages with both product development and regulation. Recent issues with companies like the Anbang Insurance Group, the Chinese insurance company that grew its wealth management business significantly and was seized by the government earlier this year, has caused the Chinese government to step up its involvement in regulating this sector. The ability for the governmental framework to support the rapidity of the evolution and innovation of the Chinese economy. Of the three attributes examined, all have largely developed in the last two decades. Given this rapid development, does the Chinese government have the knowledge and ability to regulate and support? While any government’s regulatory framework would be tested by the rapidity of this evolution, China, unlike most major economies globally, was largely not impacted and its systems were untested by the Global Financial Crisis 10 years ago. One of the reasons the Chinese financial system and the major Chinese state-owned enterprise banks were largely unaffected is they had just been capitalized with public equity capital in the years leading up to 2008. Also, these banks had not yet expanded their activities internationally. One specific concern stated frequently is the size of the Chinese shadow banking system. While the phrase is often assumed to be negative, it is not. Shadow banking exists in most markets globally, including in the U.S., and refers to banking activities that occur outside the regulated banking sector. Because these activities happen outside the regulatory framework, there is often less disclosure and information available. Entities like corporations, non-bank financial companies, pension funds and other institutions often engage in these activities, for example lending, to improve their returns. Also, with recent developments in China regarding investing vehicles for individuals like peer-to peer lending, concerns have heightened. These concerns often have to do with two primary things: the relative size of the shadow banking system versus the regulated banking system; and the lack of disclosure/transparency often affiliated with activities in China increases the anxiety. The possibility of government(s) intervening to curtail or stop some of the innovation in China’s economy. Notice that “government” above potentially is not just limited to Chinese government intervention. For China specifically, the recent announcement that video game rules would be put in place significantly impacts Tencent, with gaming being its largest business. In terms of international government involvement, the U.S. Committee on Foreign Investment in the U.S. (CFIUS) earlier this year blocked the acquisition of MoneyGram by Ant Financial for national security reasons — an example of what forces could limit some of the innovation and success as companies look to expand outside of China. Similarly, if other governments internationally are potentially uncomfortable with a company like Ant being the e-payment platform — or partnering — in their country, it significantly changes Ant’s opportunity internationally, as well as potentially the long-term investment thesis.